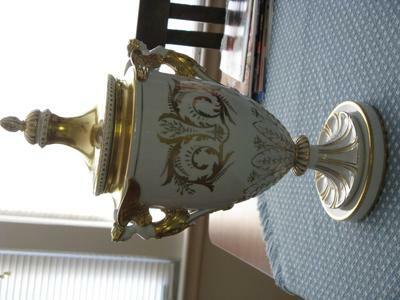 My MotherIn-Law inherited a Dresden urn from one of her Aunts. She is 83 and not much for the Internet. 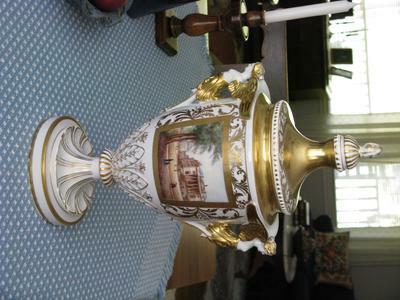 She asked if I could try to track down where any information about this piece, who made it, when, and exactly where it came from. 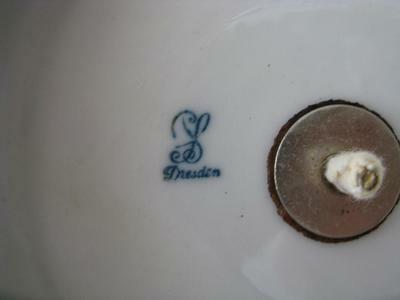 I found some marks that came close on this site after searching with a bunch of different term, FS F&S J&S on the site, but couldn't find a matching mark for this piece. So I am asking the experts at this point for help in getting some information for my Mother-In-Law on the history of her inheritance. I don't think she really cares if it turns out to be a very common piece or very rare. She would just like to know it's history. The only background she had was she knows that her Aunt and Uncle did like to travel (he was the editor of a newspaper in Peoria, IL for MANY years) and she knows they did go to Europe a number of times, but she didn't know where they went. So if you can help a lowly Son-in-law look good to his Mother-In-Law I would really appreciate it. As far as my books tell me, this mark was first introduced in 1901 and variations were later designed (the word 'Germany' added in 1914, and the word 'Original' added in 1918 with the word 'Germany removed'). So we are talking early part of 20th Century for sure. In search of more 'Brownie points' (as we say in England) from your beloved mother-on-law, you could get the value checked out. 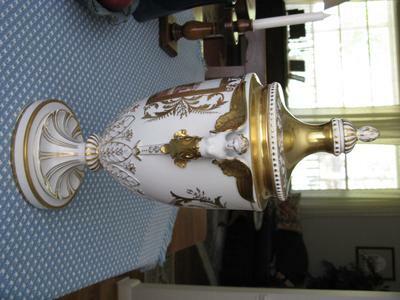 We don't normally dig into values here on the identification forums as it's way too complicated a subject, but, for example, I did a quick check of past prices obtained for Carl Thieme of Potschappel urns at auction, and the simpler ones with less decoration go for a couple hundred dollars or so, but the ones with very ornate decoration or hand painted panels can sometimes fetch a couple of thousand or so. If those panels are hand painted, you could earn yourself a son-in-law gold star award. I just sent the information to my Mother-in-law. I am sure she will be thrilled to know that they are indeed rare pieces that do have significant value.